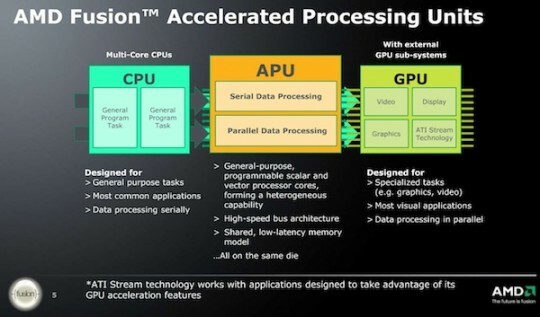 A Russian site 3dnews.ru has leaked performance estimates of AMD’s upcoming Llano Fusion APU’s (Accelerated Processing Units) in 3D Mark Vantage Benchmark. The Llano Fusion A-Series Mobile Processors will be launched on Computex 2011 which will be held within a few days. Although rumors tell the launch might be delayed till July but its highly likely for E3/Computex launch as AMD official confirmed that they don’t plan to change their public roadmap for bulldozer and Fusion here. The 3D Mark Vantage benchmark shows that all of the A-Series embedded Radeon chips performed faster than the Geforce 9600M GT chip which is considered a faster mobile graphics solution while the A8-3510MX radeon chip (HD6620G) was even faster than the GT240M Geforce chip. 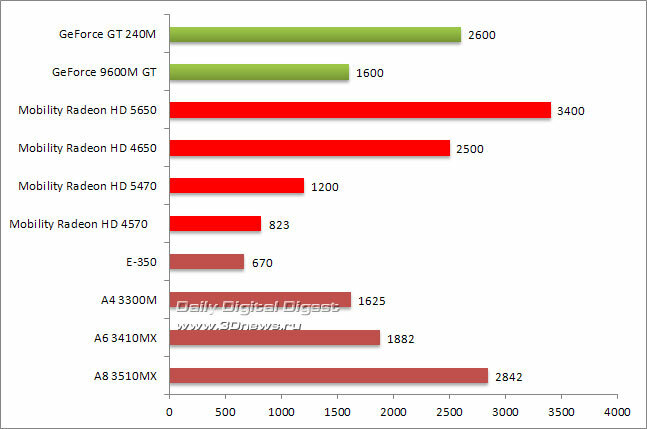 As compared to Mobility Radeon chips from 46** and 56** series, The performance of the APU’s was quite satisfactory. The E-350 however didn’t performed upto an exceptional level with a score of only 670 3D Marks slower than every other mobility chip.